The world's largest aircraft, and the only one of its type- the Antonov An-225 Mriya – is headed to Perth. Coming to deliver supplies for the mining sector, it is scheduled to arrive at Perth Airport on Sunday, May 15 about 10am. Like all flights, the arrival time is subject to change. Perth Airport management knows there is likely going to be a lot of interest in seeing the plane's arrival so have made special arrangements to cater for plane watchers. As well as the Public Viewing Area on Dunreath Drive and the Level 3 viewing deck at T1 International, the airport is setting up what they call the Antonov Event Zone. To make the most of the event zone, head towards the T1/T2 precinct and follow the event signage on Airport Drive. Parking will be free of charge in long term car parks G and K.
While it is not guaranteed that those in the event zone will actually see the touchdown, if they don't they will hopefully be able to catch a glimpse of the plane as it taxis past. View will depend on which runway the Antonov arrives on – this can only be determined by Airservices Australia on the day. Parking is free of charge in Long Term Car Parks G and K and standard parking fees will apply in all other car parks. Food vans and toilets will be set up in the area, which will be strictly no-smoking. People are also asked to wear enclosed shoes as the area is not paved. This area which is on Dunreath Drive will be open, but is expected to fill up super-fast and will be closed once is reaches capacity capacity. The Level 3 viewing deck at T1 International has limited capacity, and it is expected there will be long queues and wait times, with time restrictions put on how long people can stay for. The viewing deck and the area will be cleared of all visitors every 30 minutes. -There is restricted viewing in the rest of the airport terminals and Perth Airport does not recommended trying to use them as vantage points. The plane will be at Perth Airport until it flies out about 6am on May 18- so there could also be opportunities to catch a glimpse of it in the days after its arrival. 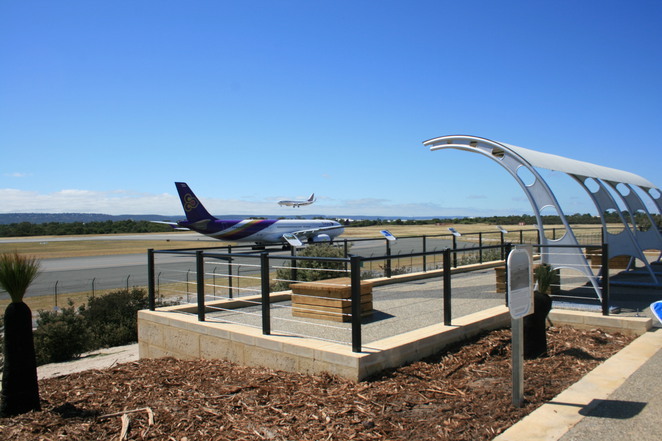 For more information visit Perth Airport's website.